I need to preface this review by stating the plot itself was a good one – however, the writing style made it difficult for me to escape into the story itself. I'm not a new reader of the author's, having read the majority of the Red Dirt series, and found The Weight of it All to be one of my favorites, one in which I never hesitate to recommend. For me, NR Walker is hit-or-miss, either adoring the novel or giving it a pass, almost as if it's two writing styles. As soon as I read the blurb for On Davis Row, I couldn't wait to get my hands on it, looking forward to escaping inside the novel until the very end. The promise of a forbidden romance between a parolee and his parole officer. Noah is new to the job, wet behind the ears, so to speak. He wanted to do good in the world, look beneath the surface of his parolee's actions, versus judging them for the lives they've led. He's written to be a genuine person. However, the character itself was missing that spark of personality to make him feel real. During Noah's narration, he was more interested in setting a scene, to the point I had a hard time connecting with him. I know I sound harsh, but that was the issue I had with the writing style. There was quite a bit of minutia. While the abundance of details can set a scene, it can also bury the forward momentum of the plot's pacing. My mind wandered, interest waning, wishing to get to the meat of the story, while wondering if these inane details were of any importance further along in the novel. Example: Del Barese was a short, older Italian man. He was balding, wore glasses and blue overalls, and had thick, stubby fingers stained with oil and grease that he waved around when he spoke. He was loud; his accent still clung to the end of his words. He was seventy-one years old, he told me proudly, and had opened Barese Mechanical in 1963 when he first came to Australia. He'd worked every day of his life, except Sundays, when he'd take his wife to church in Maitland. When Noah was narrating, everything was detailed. When he walked into a location for the first time, every piece of furniture was detailed, including its color, design, age, and wear. Even down to how many people were walking on the street, how they were eating hot chips, the weather, and the distance from point A to B, in both mileage and time taking to go from place to place. Within all these details, where was Noah? It was a pleasure when CJ Davis was given a voice. CJ's personality flowed organically, sparking with realism. CJ kept me reading the novel long enough to get to know Noah through him. Through CJ, I was able to fall into the emotional depth of the novel. CJ's had a bad lot in life, his father the corrupting force for CJ and his brothers. Just as Noah becomes CJ's parole officer, CJ's father comes back into his life to wreak havoc. The slow-burn from friends to more, as they navigated the murky waters of their imbalanced power structure of parole officer and parolee, felt realistic. It allowed for the reader to become emotionally invested in, not only the story, but each of the characters as well. 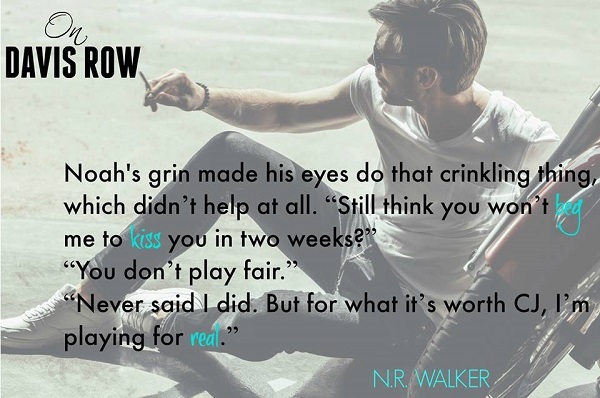 There is more than meets the eye with Noah, and it's CJ who sparks Noah to reveal it to the readers, drawing the novel into hurt-comfort territory for both parties. Due to their imbalance of power, friendship and affection are at the forefront, with considerable buildup, creating a realistic relationship that has a strong foundation to weather any storm. I do recommend the story for fans of MM Romance, slow-burn romance, and hurt-comfort. My issue comes right down to personal tastes, how the writing style didn't resonate with me, especially during Noah's narration. That can make or break a novel for a reader, but it's individualistic, as it might be the very thing that connects another reader to the character. I am a huge fan of this author. That being said, this book missed the mark for me. I liked both the main characters and Pops was great too. The story was just slow and boring for me. I didn't really enjoy the book until 65% in. After that, the book was faster paced and kept my attention. The last chapter was great, it jumped four years ahead and we saw how everything turned out in the long run. I loved how caring Noah was and how great CJ was when it came to his boss and his Pops. Had potential, but just didn't work for me. 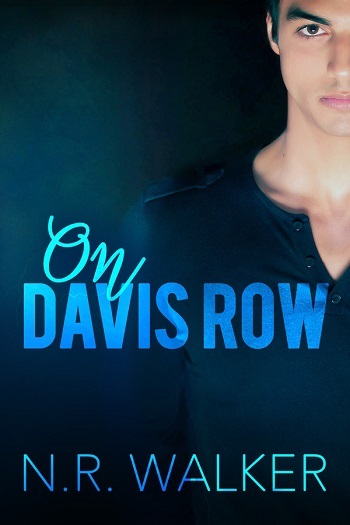 Reviewers on the Wicked Reads Review Team were provided a free copy of On Davis Row by N.R. Walker to read and review.